Heidi Zuchowski is the daughter of Sharon and Lewsi Zuchowski. Heidi is currently in her senior year of High School, and has been playing softball since she was five years old. 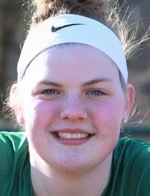 In addition to softball, Heidi is a member of the Hornet Basketball and Volleyball teams and plays on a travel softball team. Neal's home run lifts Lady Hornets over Central Columbia. Lady Hornets shutout Bloomsburg in District IV quarters. NP-Liberty advances in D-IV playoffs.